As I’ve said elsewhere, the nexus is rarely out of my hands these days and it is the primary way I do a chunk of my reading whether it’s feeds, ebooks, magazines or the good ol’ SMH. I have a monthly subscription to the digital edition and the SMH app has generally been pretty good…mostly. Fairfax seem to be putting more of their effort into developing the ipad version and less effort on the android version. Some things I don’t care about, such as the capability to display a digital replica of the print edition (ipad and desktop only). I have little desire for recreating print experiences online. Thankfully Sudoku is available in both versions but crosswords are ipad only. The TV guide is ipad only, but the weather is common to both. Then there are the software glitches such as the screenshot above where images overlay each other and cover text. I don’t know if those are android specific. There is an option to save/bookmark articles but it only lasts a short period and then the article disappears without warning. If you want to save the article for longer, you need to either go to the web version and bookmark it or use the sharing options from within the app to add to pocket (and other such). That action also saves it to the “saved articles” section within the app. Special sections aside, you can only read the current day’s news, with the previous day disappearing when you load the current day’s paper. The previous day’s sudoku also disappears which means that sometimes you have to delay downloading the news so that you can finish the previous puzzle. 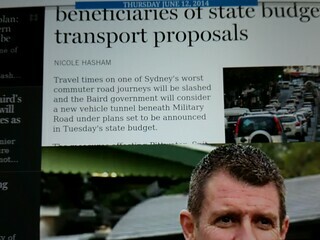 Links in articles to other sections of the SMH take you out of the app to the web version. Even worse, it doesn’t authenticate you through, so you have to login a second time for the web version.